One thing finally changed the way I feel about de-mucking my office. I got the idea from Facebook. If you're not aware of the Humans of New York page on Facebook, you might want to check it out. It has over 8 million likes. Every day the guy goes out on the streets of NYC, photographs random people and gets a little piece of their story to post online. This blog is so popular that New Yorkers WANT to bump into this guy and get their picture taken and talk to him. The posts are sometimes sweet, sometimes funny, sometimes heartbreaking and pretty much always wise. The good thing about his advice, as given, is that it puts the pressure on to make you think of something "important" you could change. Should I change my stance on the death penalty, perhaps? Perhaps not. But I could examine it and make sure it still feels right with who I am. I could walk around for a day calling for murderers to be electrocuted, just to see how that feels. I can ask myself if, even though I don't think the death penalty is good, is there some other way to single out the most heinous criminals? Or, looking at it from another angle, how do I feel about the whole eye-for-an-eye thing? Does my opinion change depending on what happened to whom? And it doesn't have to be your opinion about something, necessarily. When it comes to de-mucking my office—a room nearly worthy of an episode of Hoarders—it's less about an opinion than it is about how I see the task. I've gone years seeing it as a horrific chore that looms large over my head and drags me down. That hasn't really helped me make any progress in there. Seeing it that way makes it too large and unpleasant. But recently it has occurred to me that if I'm ever going to realize my dream of moving and becoming an author and all of that, I'm going to need to clear out that room. You can't show a house with a Hoarders room. And you can't just move and leave all that crap in there. So I started seeing it differently. So now, each weekend, I spend an hour or so in there "moving toward my dream" instead of "mucking out my Hoarders room". I've been pretty consistent with my efforts ever since. You could translate this advice to a lot of things. You could change the self-talk that happens in your head when you make a mistake, for example. The way you see yourself in the mirror. The things you're willing to put up with in your personal life. You could change the way you think and see everything everything in life...or at least think it through again. After all, if we're constantly changing and growing, then chances are some of the ideas we have about things and some of the hair-trigger responses we've developed over the years should change too. Even more than that, though, is that it's a good exercise for keeping your mind open. One of things I like to say is "only a fool thinks they've got it all figured out." Truth is, the more you know about things, the more you realize how much there still is to learn. I think after 27 years in both advertising and as a tarot reader, it's fair to label me an expert in both areas. And knowing what I know, I know I'm not even close to knowing it all. One lifetime is not long enough to know it all. So to me, a closed mind is one of the most unappealing qualities a person can have. It says their ego is so tied to being "right" that they've become blind to what's going on around them. It also says they're missing a whole lot along the way. When opportunity comes up against a closed mind, it dies. Of course, we all have that in some places. Like right now my mind is closed to wearing one of those wing suits and jumping off a mountain. But for the most part, an open mind is the sign of an intelligent, vibrant and alive mind to me. And spiritually speaking, an open mind is key. I mean, nobody has THAT figured out for sure and anyone who thinks they do is a fool. So what can you re-think today or this week? 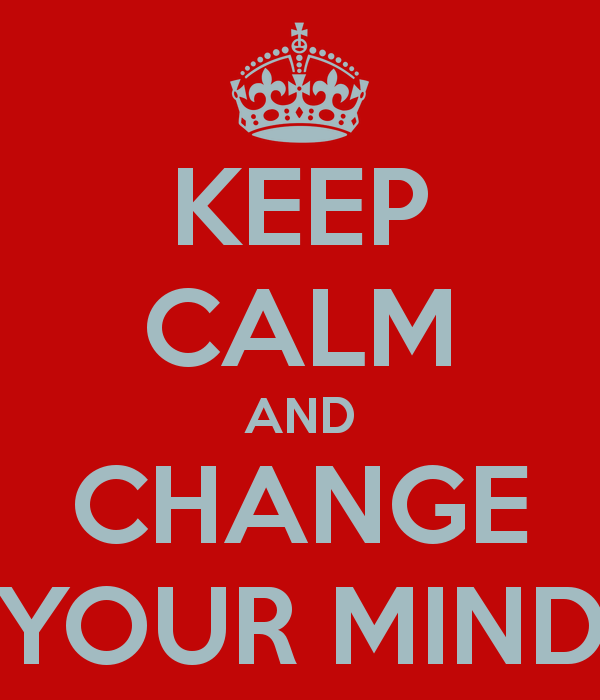 What one thing can you change your mind on, even if you change it right back? Just the act of changing your mind about something puts you in different shoes and shows you the world from a different angle. We feel safe and comfy in the cave of opinions and stances we build for ourselves, but safe and comfy don't lead us to growth. What are you willing to re-think today?